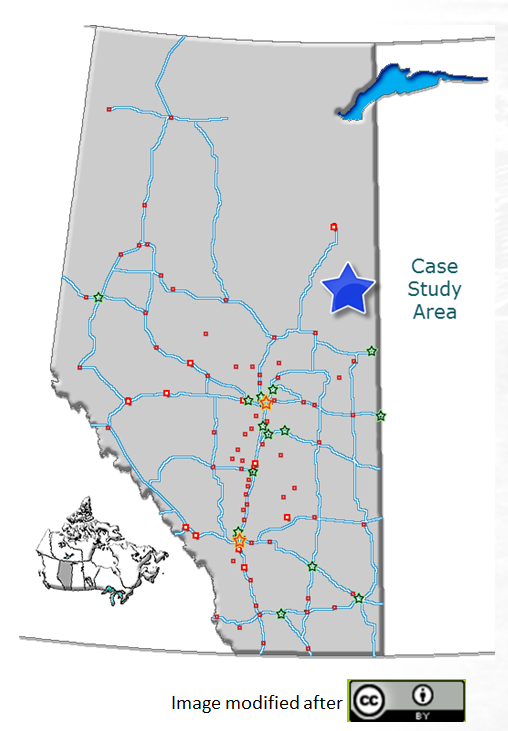 Geomodeling’s SBED product services were used for a steam assisted gravity drainage (SAGD) permeability project by an oil sands operator. Highlights of this permeability study follow, as well as a link to the published SPE Paper. From a producing McMurray Formation reservoir (Fig. 1) the impact of centimeter-scale reservoir architecture on permeability was demonstrated. High-resolution 3D models of the near-wellbore region were constructed to characterize observed variability in percentage, orientation and dimension of mud laminae, breccia clasts and trace fossils; classified into nine heterolithic reservoir facies from the cored intervals of eight wells; aimed at understanding and evaluating uncertainty in previously completed core permeability and Volume Shale (VShale) correlations. The relationship between permeability and VShale is proving to be important to the complete understanding of oil recovery, particularly in Steam-Assisted Gravity Drainage (SAGD) projects. To define the interrelationship of Vshale and permeability, various oil sands template models were stacked then used to create near well bore property models. From these high resolution models, it was upscaled at the resolution of the VShale log using a flow simulation based numerical method. 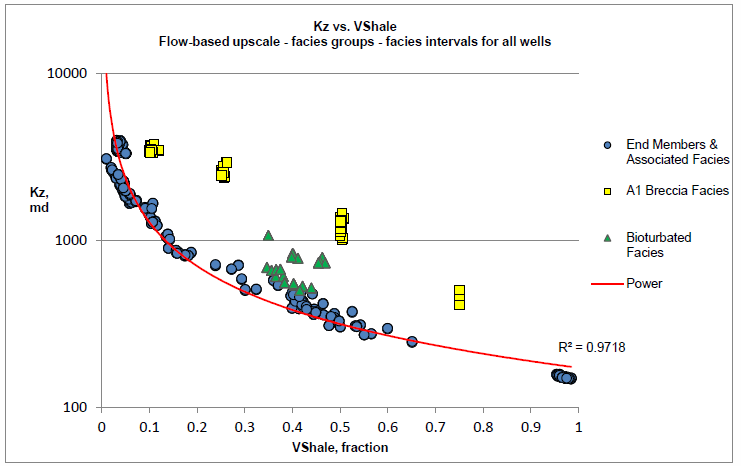 Flow based upscaling results are estimates of effective permeability (kx, ky, kz) which define the interrelationship of permeability and VShale (Fig. 2). Figure 2. Case Study Workflow. Oil Sands facies templates are stacked and used to create near well bore property models. 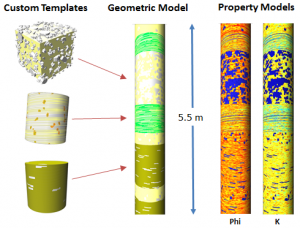 The property models are then upscaled to the volume shale log resolution of 1 meter using a fluid flow simulation. Figure 3. 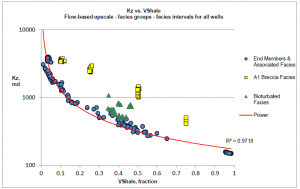 Crossplot of flow-based vertical permeability (Kv) versus shale volume (VShale). Trend lines correspond to two vertical permeability and Vshale correlations (IHS and Non-IHS facies). We have established a set of correlations between vertical permeability and shale volume by applying geology-driven 3D near wellbore models. 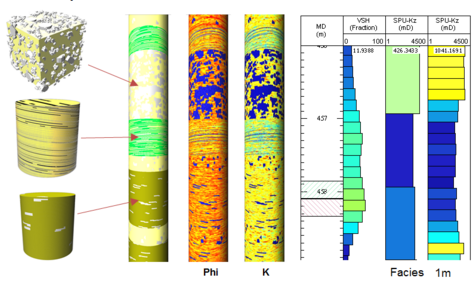 These correlations at the scale of volume shale log resolution are used to create reservoir scenarios which provide better distinction between low and high permeability areas in the reservoir scenario model. This workflow has the potential to improve history matching in flow simulations and improvements in well placement and performance forecasting.